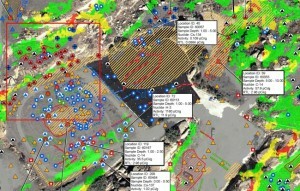 More than half a century since several partial meltdowns at the former Rocketdyne complex above Chatsworth and Simi Valley, astronomical amounts of radiation are still being unearthed at the site, according to a new U.S. Environmental Protection Agency PowerPoint dated February 22, 2012. The presentation shows current radiation readings at the now-demolished Sodium Reactor Experiment, or SRE, at levels thousands of times above background. “It is remarkable that a site of a partial meltdown is still contaminated, half a century after the event and after two prior cleanups that supposedly had cleaned the site up thoroughly,” said Dan Hirsch, president of the Committee to Bridge the Gap, the organization that first exposed the meltdown in 1979. The SRE was the site of an uncontained partial meltdown in 1959 that released hundreds of times more radiation into the environment than the Three Mile Island meltdowns did twenty years later. 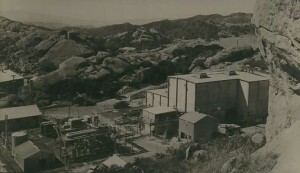 Brownley expressed disappointment that the site had been supposedly cleaned up twice before by lab owner Boeing and the Department of Energy which controls Area IV where all of Rocketdyne’s nuclear work was conducted. Partial meltdowns occurred there in at least two other reactors in 1964 and 1969. That may be easier said than done. This latest U.S. EPA information appears to redefine what cleaning up to background actually is. Publically available documents show that the levels of radiation in this part of Area IV where the SRE once stood are actually many thousands of times more contaminated than previously thought. Bowling, like Brownley and other people fighting for a comprehensive cleanup of the sprawling outdoor laboratory, didn’t see the bait and switch and assumed the RTLs were accurate. The radiation sampling results are even more astonishing than Brownley demonstrated especially when using the actual backgrounds, unlike the PowerPoint’s RTLs that have inexplicably raised the background levels by many multiples. 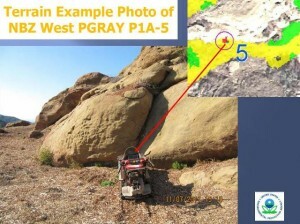 Soil sample #60540 was laced with cesium-137 which clocked in at 9,328 times its background as shown in a July 2011 U.S. EPA “Radiological Background Study Report” for Rocketdyne in Table 8.4. Yet the EPA’s RTL in the PowerPoint is over 25 times the same agency’s 2011 background study for subsurface samples of the cancer-causing radionuclide. A shallow soil sample by the side of the road on the way to the SRE was sizzling with cesium-137 over a thousand times its background but perhaps as troubling, the EPA’s radiation trigger level for important radionuclides like Cs-137 and strontium-90 each were given an RTL that was the same for both surface and subsurface sampling. In the arcane world radiochemistry, this is significant. The RTL given cesium-137 in the PowerPoint was nearly equal to the actual background level of Cs-137 at Rocketdyne on the surface. Dig a little deeper, literally, and the the Cs-137 RTL becomes 25.78 times its “background threshold value” or BTV. This EPA sloppiness or bait and switch does nothing to comfort concerned taxpayers that, with the millions of dollars thrown at the lab to clean up its goo, the agency can not seem to keep its numbers straight. Or worse yet, never planned on using them. 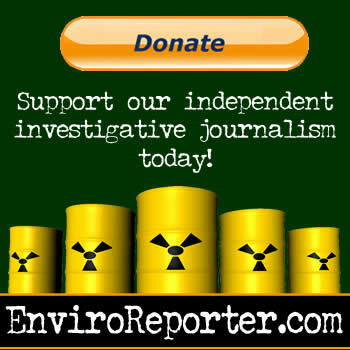 An EnviroReporter.com analysis of the data shows that U.S. EPA has a single RTL level for bone-seeking radionuclide strontium-90 even though the same agency has two BTVs for it according to its own report. 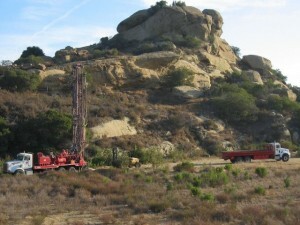 On a scenic bluff overlooking Simi Valley next to where the SRE once stood, leukemia-causing strontium-90, which has been found at high levels at Rocketdyne-adjacent Runkle Canyon where KB Home hopes to build hundreds of homes, soil sample #60446 was assigned an RTL 6.47 times Sr-90’s BTV and tested at 284 times background. Soil sample #60200 inexplicably had a strontium-90 RTL over 37 times its BTV.The dirt came in at over 71 times background radiation in a sample dug out a foot to two feet below the surface. This suggests that even after two “cleanups” the area may be facing a huge excavation job in order to bring the environment back to a state where it isn’t riddled with radiation and chemical contamination. The switch was done by the same agency that generated the data in the first place, the U.S. EPA. Make that switches. Radioactive heavy water tritium had an EPA RTL nearly double its actual EPA-derived background and was found in soil 172 times what EPA had determined was normal background. So not only was it hot, it was measured using as a standard an RTL that made it look half as dangerous. Fuzzy math also made its mark on the carbon-14, cobalt-60, neptunium-239 and europa-152 RTLs, all several multiples of their actual backgrounds. At risk of interrupting the flow of this piece, but in the interest of folks and government officials complaining that they have trouble understanding this analysis, we’ve summed up what appears to be a pattern of Radiation Trigger Levels that exceed their respective Background Threshold Values when the two figures should be equal according to the purported goals of this very expensive cleanup. Not a single RTL was less than its BTV because every single one was higher, some by many times. Cesium-134’s RTL was 2.88 times its BTV and was detected underground at 3.63 times its background. The RTL for Europium-152 was 3.35 times its BTV and found at 860% of background. The EPA made cobalt-60’s RTL 5.04 times its BTV, a radionuclide found in one spot ionizing 8.6 times normal. Even higher were multiple readings of carbon-14 up to 22.80 times its background. EPA left C-14s BTV relatively alone assigning it an RTL just 17% about EPA’s background for the radionuclide. Neptunium-239’s RTL was inexplicably raised by a factor of 3.26 times its official EPA background and was found in a sample decaying away at 4.52 times its BTV. Presence of this artificial element indicates plutonium-239 from which it decayed. Nothing could be more worrisome than the manipulation of the levels determined for plutonium-239/240. The isotope is one of the most potent radioactive killers on the planet yet the EPA’s radiological trigger level was nearly twenty times its background. Exposure to even minute amounts of Pu-239/240 can give a person lung cancer. Misleading and factually incorrect numbers not only reduce the radiation readings of overages at Rocketdyne, their use could lead to leaving large amounts of radiation in place once the cleanup, which has cost hundreds of millions, ends as soon as 2017. This could save Boeing and the government millions while making it appear that the Agreements on Consent were being adhered to. The EPA official said that he would look into the issue. The Agreements on Consent, or AOCs, that Brownley referred to was supposed to see the site cleaned up to background with a thorough radiological and chemical cleaning in the Department of Energy’s Area IV as well as NASA’s chemical pollution at Rocketdyne. The wording of the AOCs seems pretty clear and that’s to clean every contaminant up to background, not multiples of it. The AOCs with DOE and NASA explicitly say that contaminated soils must be removed, not be left in place or buried. Yet with these huge radiation readings and markedly lower cleanup standards that violate the agreements, the hot zone that is Rocketdyne just got a whole lot hotter. With the government changing the radiation trigger levels, Rocketdyne may not turn out to be a very attractive location for a park after all, let alone houses. Even 53 years later, the site of the worst American nuclear reactor disaster still hasn’t been cleaned up though it sits in amidst millions of Southern Californians at the headwaters of the Los Angeles River. Father CANCER DEAD, MOTHER, CANCER, DEAD, BROTHER, CANCER, LIVES WITH SERIOUS DISABILITY, SISTER, CANCER, STEPMOTHER, CANCER! Me not yet! Am 57! Lived in Simi Valley 1962-1976, left in 1968 until 1972, then back four more years! Father was there longer. Brother says used to play by this! Just found out about this a few months ago! Shocking! The latest report (a few days ago) triggered this topic again. I’m currently in the process relocating my family to Oak Park. Do you know if the soil is still contaminated in Oak Park? Is this something we should be worried about today? I morn for those who were affected by this irresponsible situation. I lived in Simi as a child of the 70s and 80s. I have lost a handful of friends I knew since kindergarten from all kinds of cancers that too spent there lives there. I myself am 40yr old know and have 2 very rare diseases on the NoRD list, one of which there is little information on. I have always wondered if that “FALLOUT” was to blame. Where can we find information on all the lives this may have affected??? They have now proceeded building the houses and park. It is beyond belief. Years ago before I knew how bad it was I used to go running up there and found several places where “tanks” were buried. 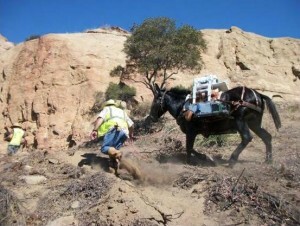 I used to find dead cattle that drank water in the area. Then the cattle disappeared and they put a security guard there 24/7 to keep people from hiking or walking their dogs up their for many years. I know many people who have died in Simi Valley of the types of cancers this creates, including my little sister in 2008 and two complete families on my street. Many when the construction workers start dying it will get the type of attention it needs. my father worked at rocketdyne, building all the switchboards and communications systems for pacific telephone since it was built. I remember going there with him many times for career days at school and tours in the boy scouts. No wonder he died at 64 from cancer! The only reason this is getting attention is because they are dying to build on it. Just cut a hole out of the map of the US and reduce the land area of our country by 100 square miles. This place will forever be uninhabitable. Thank you for publishing this report, I have been living for 27 years in Simi Valley, but did not know that much about it, I strongly support clean environment and the government has to take strong action and save our innocents lives. What I DON’T understand about this article: What caught my attention was the cobalt-60, which Arnie Gundersen says is a sign of RECRITICALITY, and the neptunium, which has a short half-life so can [also]only be generated by RECRITICALITY. This is obviously a site that CANNOT be cleaned up, just sanitized somewhat. It’s still giving off MORE radioactivity after 50-plus years. Like Chernobyl too, where they are “puzzled” that the cesium levels in the soil keep INCREASING over time. Push for more clean-up yes, but MELTDOWNS APPARENTLY DON’T STOP GENERATING HUGE AMOUNTS OF NEW RADIOACTIVITY. Fukushima, of course, is the worst, and obviously ONGOING. And humanity did this for WHAT? Cheap electricity? It’s never been cheap monetarily and the cost in human lives is horrendous. Thank you for all your valiant work, but can humanity be saved? We have our doubts. Thank you so much for this update. The new examples you include are shocking. Did no one bother to check the July report you linked to? I am glad the EPA official changed his mind and hope he gets back to you soon. Thank you again for letting the community know what’s really going on! @All: This article was updated March 11, 2011 and includes new facts and developments. The problem is background radiation is now over 3,000 times over normal due to the tons of fukushima corium tossed into the air … how are they goin to clean that up ? o_O ? Kudos Mr. Collins: Excellent expose. It is impossible to underestimate the US public’s ability to put their heads in the sand, denying and repressing real threats to their very existence. Right on Mr. Collins – WRITE ON! “May you live in interesting times” Ancient Chinese curse. NO nukes are the ONLY safe nukes. ALL of the world’s unshielded nuclear material MUST be launched into the Sun – ASAP – as leading scientists called for 35 or more years ago – in order to SAVE MANKIND, not to mention everything else on Earth that is being poisoned by this deadly Jeanie that can never return to its bottle…. I had not seen this one. Thank you Michael for this excellent article. Once again, we must clean this site to strict standards-clean it to the AOC standards. Peoples’ health is important. When is a contract not a contract? When it is signed by the US government. Seems to me that the agreement to clean to background levels, the so-called landmark agreement that Boeing refused to sign, would obviously be referring to the background levels that existed at the time of the signing of the contract. Too bad that no one foresaw this slimy, sneaky maneuver and placed the numbers of background levels right in the contract itself. But if there are documents that measured the amount of background radiation which were accepted by all parties when the agreement was signed, it seems to be a given that those numbers will stand. Making up new standards after the contract was signed is a breach of contract. Come on, EPA, stop lying! Do your job. Or get out of the way and let others do the work. I don’t think anyone could have predicted the absurdity of leaving dangerous levels of all forms of radioactive and toxic chemical contamination untouched in the middle of a city for more than half a century. Are we, as a democracy, that incompetent? Are we that impotent? It is really, really scary. I thank you also, Michael, not just for this article, but for all of the environmental reporting that you have been doing for a long time. It is obvious that this is not just writing to you, but that your heart is really dedicated to the task of helping to save the lives of potential cancer victims of the Santa Susana Field Laboratory. It is also extremely troubling that the Boeing Corp. has supposedly cleaned up the field lab of radioactive substances twice. Just this fact alone underlines in blood red the fact that the next cleanup absolutely needs to be to background. Just twice over lightly obviously has not cut it!! Thank you Michael for a well written and comprehensive article. As a cancer survivor and former worker, I have seen the destruction of lives and health of workers. We have a moral duty to do our best to monitor the property and assure that future generations are safe. It is time to silence the “deniers”. The truth is laid before us.